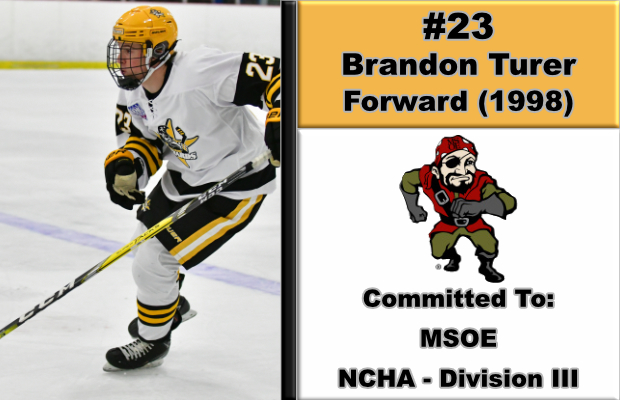 BEDFORD, MA -- The East Coast Wizards are pleased to announce that Brandon Turer has committed to the Milwaukee School of Engineering for the Fall of 2018. In his first season in the EHL, the '98 from Wisconsin racked up 26 points in 40 regular season games. "Brandon has been an absolute pleasure to coach this season," said Wizards head coach and general manager Freddy Meyer. "Kory [Falite] and I are very proud of the way he battled back from a mid-season injury, and continued to develop throughout the year. Brandon has a very bright future ahead of him, and I am looking forward to following him on his journey." After three seasons in the Tier 1 Elite League, Turer made the decision to come to the EHL. His play at the U16 and U18 levels transitioned well into the junior game, and he ended the regular season with at least a point in five of the final six games. Turer took some time to reflect and give thanks. "The Wizards organization has helped me mature not only as a hockey player, but off the ice as well," said Turer. "It's a high class organization that rivals that of any tier 3 junior team. Coaches Kory Falite and Freddy Meyer have really helped in skill development and the transition to junior hockey. Strength coach Adrian Peacock has also been a great help in preparing my body for games and maintaining my strength. Overall, it's been a great year and I can't wait for a playoff run with the great group of guys we have. I would like to thank my family for everything they have done in giving me the opportunity to play the game I love for so long."